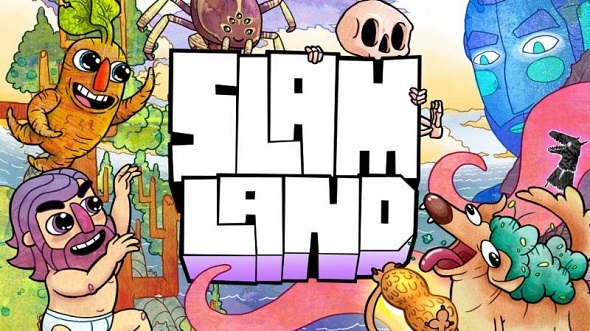 Slam Land certainly sounds like a fun land in which you can slap annoying people around and well, slam them against a wall when the situation calls for it. Funnily enough, this isn’t too far away from the truth as in Slam Land you’ll be able to pick up your opponents and slam them into the goal, scoring points by pretty much destroying them. While the game offers a few different game modes, prepare yourself for a hectic, yet monotone party game that is best enjoyed with friends, rather than playing against the AI opponents. There is no story present in Slam Land, as it’s all about wacky cartoon characters throwing each other in a makeshift basket to score points. While there are different modes available, they pretty much end up being the same thing, all of them requiring no story or elaborate plot to be enjoyed. Overall it would have been nice if there was a bit of a backbone to the game, but we managed nonetheless. 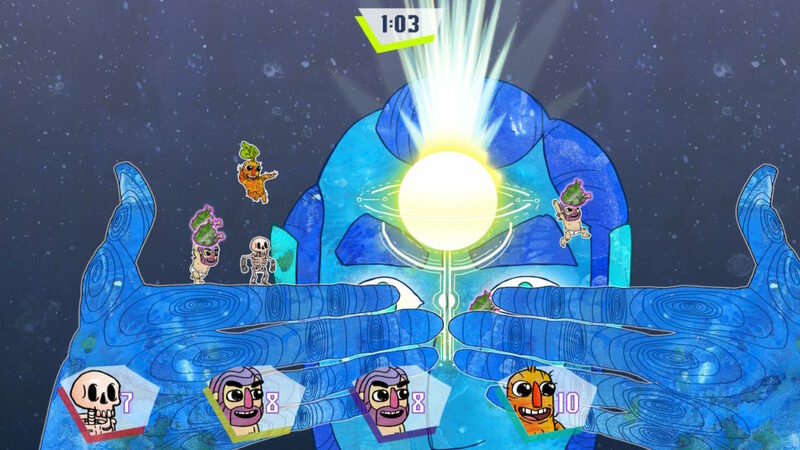 Graphically Slam Land is a very colorful game with wacky comic book characters and a completely drawn style. The game is visually pleasing and the vibrant color palette make this title actually very attractive, even with the rugged drawings in place. Each character comes with a variety of different skins, to make sure your player is recognizable, and the different arenas are all fairly attractive, with different ‘baskets’ in place for you to dunk in your opponents or items. 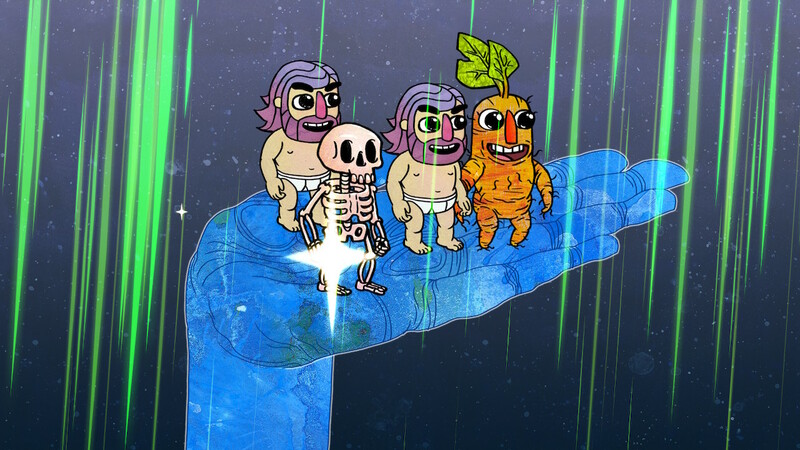 Overall the game is pretty and succeeds in its objective of being a bizarre, yet hectic experience. The sound design of the game is catchy, especially with all the jump noises, the slam sounds and overall chaos that ensues. The music is catchy, but barely noticeable in the midst of your slamming sessions, making it somewhat redundant, as there is simply no time to pay attention to the background noises and music. 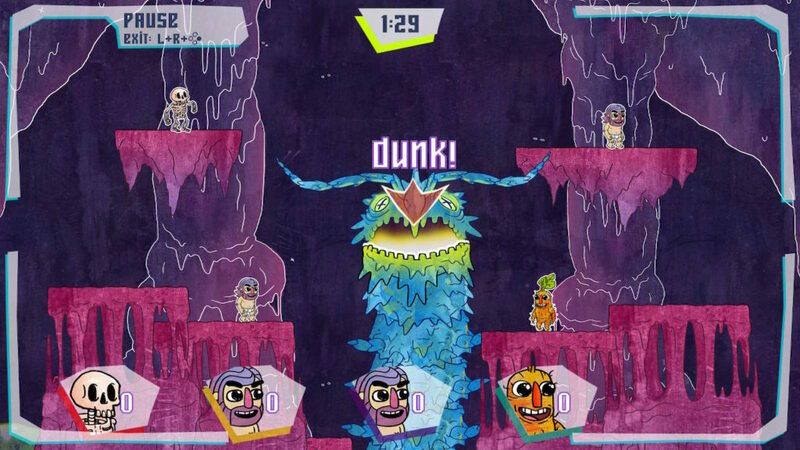 Slam Land is an arcade game that revolves around throwing your opponent into a basket. You can either throw them in, or dunk them, the latter often giving you more points so it seems. You can pick up a player, or a player that has picked up another player for more points. The other game modes are Horse, Peanut or Trash. In Horse you’ll have to pick up horse masks that represent one of the letters of the word ‘horse’, and you will win the game if you spell out the complete word. The order in which you collect letters doesn’t really matter. Peanut will spawn a peanut that gives you a higher score the longer you hold it before dunking it. Last but not least, Trash is all about collecting trash bags and throwing them in the basket to earn more points. The more bags you pick up before you dunk them in, the more points you’ll get. The game only uses two buttons, namely the jump and grab button, the latter can also be used to traverse small distances in the sky. This means that the controls themselves are simple, to the point and easy to learn. Throwing your opponents is a different matter all together, as you’ll have to aim with the left stick, which isn’t easy in the heat of battle. Dunking your opponents, or items is always easier, but when you hold an opponent too long, they might just get away from you or items can be snatched if you don’t pay enough attention. You’ll notice that the game is rather chaotic, which is actually the most fun part of the game. You can play with up to four players, and we have to be honest, it’s most fun when you have a full party, as this is simply the most chaotic, and thus the most interesting. The gameplay itself is fun, for a short while, but it becomes a bit bland if you’re looking for something to play for a longer period of time. Overall this is one of those titles best enjoyed with friends or in-between other titles. Slam Land is a fun snack sized game that works well when you invite people over, or as a party game for a short period of time. While the game looks nice on the outside, and introduces very simple, yet hard to master, mechanics, it feels as if it lacks in game modes, diversity and overall replayability in order to become top of the charts. That being said, as a multiplayer experience you’ll certainly have a few laughs with this one, as a single player type of game it’s not very fun or enjoyable as you’ll have no one to scream at.